In July 2014 Premier Guitar released a cool Rig Rundown of Larry Carlton gear shot in his studio. The video is cool despite the fact that we don't get to hear Larry play except at the very beginning. 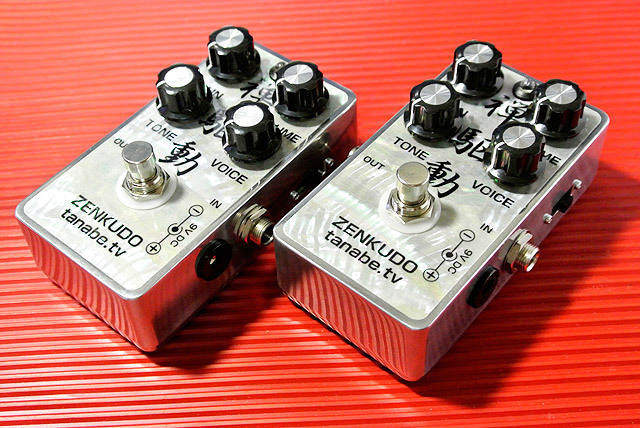 Anyway, it's in this video (see below) that I first heard about the Zenkudo overdive pedal from tanabe.tv. I decided to contact the builder, Toshihiko Tanabe, to do this mail interview to learn more about this great Japanese boutique pedal builder. PJ: What is your training? TT: I am not from electric engineering background, I started as a hobbyist. I am self-trained. PJ: Are you an electronic engineer? TT: No but I made them by myself, alone. PJ : Why did you start to build pedals? TT: I struggled with some personal problem in 2006. One of my friend advised me to build a pedal with new old stock parts such as Japan Radio Company OP-Amp that called gloss version 4558D. I found that building a pedal was fun. PJ: What is the inspiration behind the different pedals you produce (Zenkudo, Dumkudo, etc. )? TT: I build them with the sound I wanted to hear. PJ: How do you fine tune a pedal? Do you have a Dumble amplifier at home to compare the tones for example? TT: No, my final goal was not the sound of the Dumble. After I completed my first pedal a few of my friends told me that the sound was like the Dumble. PJ: How did you get in contact with Robben Ford? 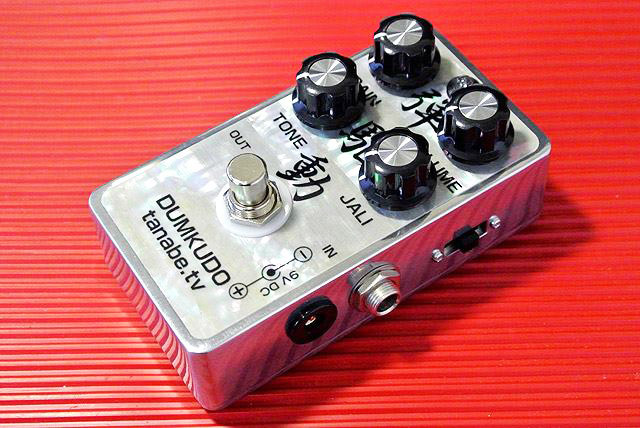 TT: In the year of 2011, when he was looking for a new overdrive pedal, the president of Vertex effects recommended him my Dumkudo pedal. Robben liked my pedal and I was contacted form Vertex effects to have some pedal orders. In 2012 February, while Robben was in Japan, I met him and his tech. Rick. PJ : How did you get in contact with Larry Carlton? TT: Rick (technician from Robben Ford) is also taking care of Larry’s gear and he found the pedal on eBay. He bought it and recommend to Larry. I was told from Rick that Larry liked it very much. So, I made the new one from scratch for him. PJ: Any interesting stories you can tell about the famous users of your pedals? TT: Paul Jackson, Jr. is my first famous user and I went to see him in 2010 in L.A. I was very anxious about his late appearance, I was not sure if he was to come or not. But we finally met at restaurant and became friend, we had a fun time. Henry Kaiser liked my pedals very much and he is my best friend now. I built him a lot of new pedals such as Fuzz box and various of overdrives. He brought them to Antarctica and played just for fun. Then I got a order from Antarctica. And he introduced me to a lot of his friends. PJ: Are you going to develop a signature model with one of those artists? 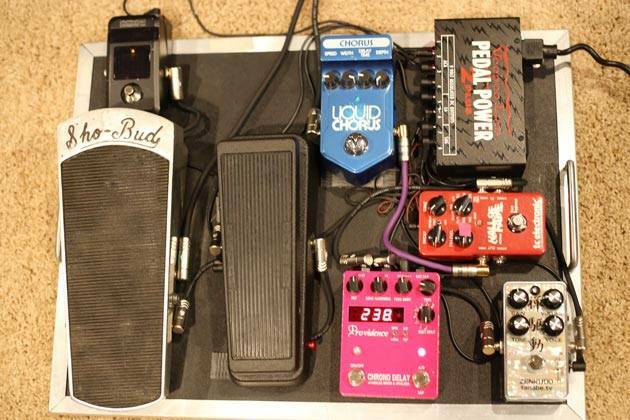 PJ: Does your pedals have to be plugged in a tube amp to perform the best? TT: It sounds great on a tube amp but my pedals are also suited for solid state type amplifier. PJ: What are the future projects you are working on? TT: I am planing to build a tube amp. 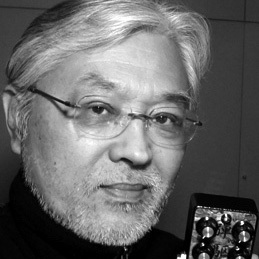 Thanks a lof for your time Mr Toshihiko Tanabe, I sure hope to try one of your pedal in the near future. I haven't tried (yet) a tanabe.tv pedal but no doubt that if Larry Carlton and Robben Ford are using it, it must be a pretty sweet sounding overdrive. The pedal has 3 modes, Marshall, Dumble and Zenkudo. Many people seem to say that the Dumble mode comes pretty close. The conception of both pedals is identical. The Dumkudo has more gain is more suited to single coils when the Zenkudo is better for humbuckers. The Zenkudo pedal is bottom right. You can read a French version of the interview here on La Chaîne Guitare. August 31st 2014: my video review of the Dumkudo is available in this article, check-it out below! You enjoyed this article? Subscribe for more!